How do I share my work with my colleagues? Tags can be used to share your work with colleagues as well as to organise your work on Agility. 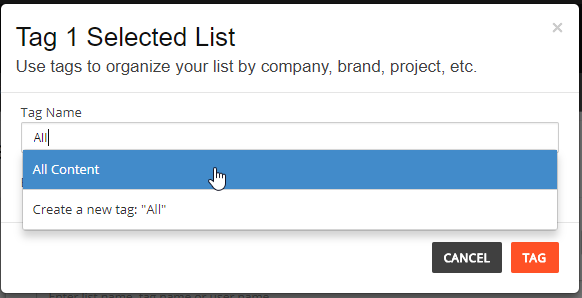 We share lists, topics, alerts and more with colleagues by applying tags to them. Tags can be used to share your work with colleagues, firstly by selecting them as your collaborators for the Tag created, then assigning the Tag to the Agility content you want to share with them. When they sign into their own account, they will see the content you have shared/tagged. You can also create multiple Tags and use them as folders to organise your Agility content into different projects. Step 3. Click on the name of the Tag to assign collaborators. Step 4. Select your collaborators from the list. Step 6. Partially type in your Tag name and select from the drop down. 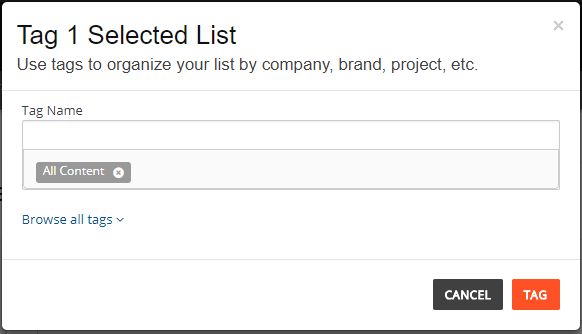 List has now been tagged and collaborated with your colleague/s. NOTE: All content created on Agility can be tagged (Targeted lists, Saved searches, Distributions, Saved topics, reports etc).